This image was posted to the Facebook ‘Nostalgia Pro Stock’ group. 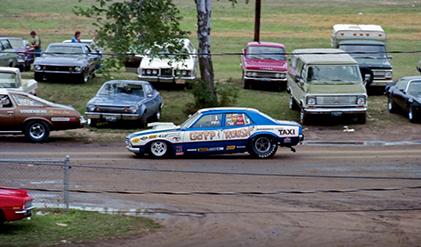 It was taken in 1974 by Tom Nagy and it was taken at the Popular Hot Rodding Meeting at Martin, MI (US 131 Dragway). I can’t imagine today’s $250k Pro Stock vehicles being seen doing this…that is driving back to the pits…over a dirt road no less. Then again, today’s cars barely look like a ‘stock’ car, the vehicles have carbon fiber bodies, have incredibly high tech engines running…carburetors and are about as far from the origins of the class as they can be.